Hey guys, wanted to post a project I'm working on. I'm not totally done yet, but wanted to post a few phone pics and get some feedback as I'm waiting for the finish on the handle to dry. As the thread title suggests, this is not what would be considered a puukko in the "purest" sense, but it is my take on the style, and makes the changes I like in a knife, while hopefully retaining enough of the original inspiration to still be called a puukko. The blade is made out of O1 tool steel, hardened at 60 for good edgeholding. Instead of the typical scandi or partial height grinds, I went with a full flat grind. It may not be real clear in the intial pics, as they are from my phone. I will take better quality photos once it's done this weekend. I know the partial height grinds are popular on these knives and give a little added strength if you're beating on it, but I much prefer the added cutting performance of a full height flat grind combined with a thin edge. I left the tip fairly stout anyway, so short of abuse there shouldn't be any problems. Blade is 1/8" stock, 4.25" long. Obviously it is a through tang, and the guard and buttplate are both stainless. Handle is curly maple. I will have better shots of the silver soldering and such later on. 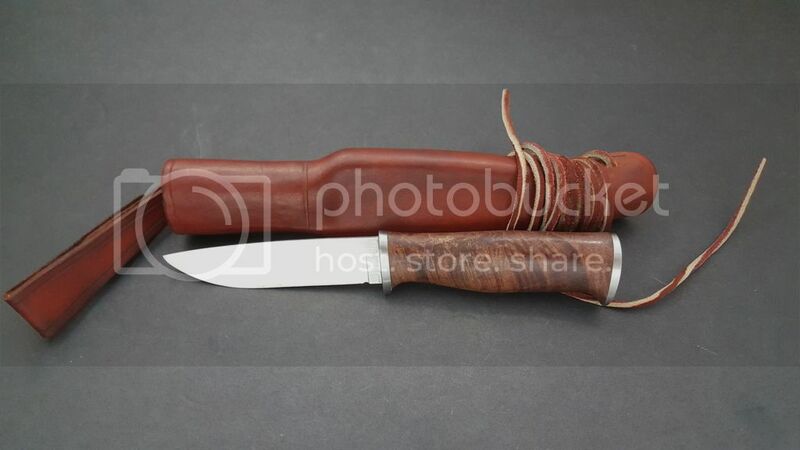 Sheath is in the traditional style, with wooden liner. I used 10 oz. leather on this one, so it is a very durable sheath. The friction fit locks it in very well, you could wear it as a neck knife if inclined with no issues. It is locked in there and won't come out unless you want it to. So anyway, here are some pics, please feel free to ask questions or give comments. I'm happy to hear it all. HOLY COW, I'm speechless! Well, not really.....but that is just simply gorgeous craftsmanship all the way around! I'm just as impressed with the sheath work as I am with the knife. You should be mighty proud of that whole package, Sam.....I sure would be, IF I was capable of that kind of workmanship! Super nice work. Enjoy using it. verry nice made, how did you attach the but cap? Beautiful work! Both knife & sheath! Thanks for sharing your pics & narrative! Thank you very much. That is a very nice compliment, and I appreciate it very much. Let me tell you, molding that 10 oz. leather was more difficult than grinding the blade, lol. Much appreciated, MnSportsman. I didn't think this was a good candidate for kydex . Thank you. I attached a nut to the bottom of the buttcap, and then threaded it onto the tang. If you were to call is something other than a puukko- style; what would it be? That's a good question. Technically it would be a small through tang knife. I would probably go with "bushcraft/field knife." I guess, lol. I don't think you mentioned the wood finish, but I didn't re-read the OP. Tung oil for the finish. That is beautiful Sam.......nicely done!